The U.S. government has had Tesla-based quantum access time travel technology for over 40 years. Time travel technology has been weaponised with its principal impacts to date being for the sequestration in time loops of secret military installations, such as U.S. secret bases on Mars, political control of the human population, political surveillance, and attempted imposition of a catastrophic timeline on humanity by withholding or manipulating information about future events. Two independent whistleblowers from the U.S. national security state have come forward with congruent, sophisticated, and extensive insider accounts of their experiences with Tesla-based time travel technology developed by the U.S. Department of Defense. Mars colony eyewitness Michael Relfe is a whistleblower and a former member of the U.S. armed forces who, in 1976, was recruited as a permanent member of the secret Mars colony. In 1976 (Earth time), he teleported to the Mars colony and spent 20 years as a permanent member of its staff. In 1996 (Mars time), Mr Relfe was time-travelled via teleportation and age-regressed 20 years, landing back at a U.S. military base in 1976 (Earth time). He then served six years in the U.S. military on Earth before being honorably discharged in 1982. 1. People visiting Mars temporarily (politicians, etc.) – They travel to and from Mars by jump gate. They visit for a few weeks and return. They are not time traveled back. They are VIP’s. They are OFF LIMITS!! Four independent whistleblower witnesses, including Michael Relfe, have confirmed the existence of one or more U.S. secret bases on Mars, as forward strategic military bases for occupation or defense of the solar system. These whistleblower witnesses include, besides Michael Relfe, former U.S. Army Command Sgt. Major Robert Dean, former participant in DARPA’s Project Pegasus Andrew D. Basiago and former U.S. Department of Defense scientist Arthur Neumann. 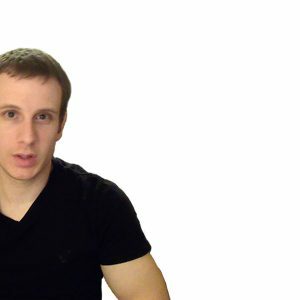 Andrew D. Basiago is a former participant in DARPA Project Pegasus (1968-72) that developed Tesla-based quantum teleportation and time travel in the time space hologram, initiating the U.S. program of time-space Chrononauts. 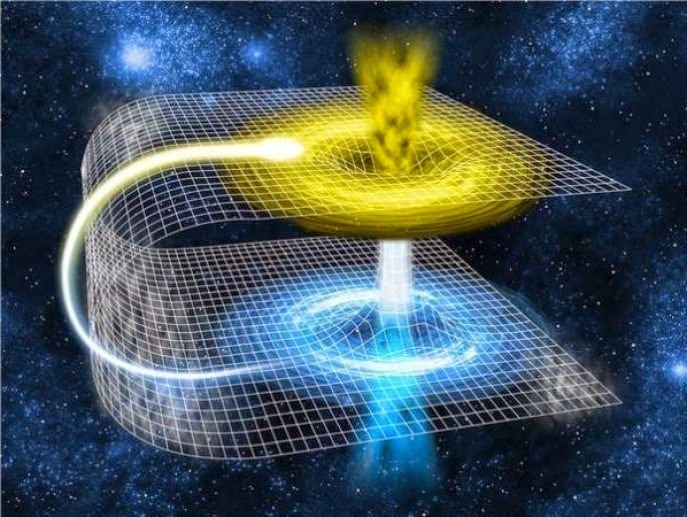 According to Mr. Basiago, the U.S. government already had a fully operational teleportation capability in 1967-68, and by 1969-70, was actively training a cadre of gifted and talented American schoolchildren, including himself, to become America’s first generation of “chrononauts” or time-space explorers. This training, he said, culminated in 1981, when, as a 19-year-old, he teleported to Mars, first by himself after being prepared for the trip by CIA officer Courtney M. Hunt, and then a second time in the company of Hunt. Both trips, Mr. Basiago said, were made via a “jump room” located at a CIA facility in El Segundo, CA. The apparent purpose of the trips to Mars was to familiarize him with Mars because the CIA knew of his destiny pertaining to publicly establishing the fact that Mars is an inhabited planet and deemed it important that he visit Mars and experience its conditions first-hand. Mr. Basiago’s involvement in advanced U.S. time-space research as a child, as well as Courtney M. Hunt’s identity as a career CIA officer, have been confirmed by Dr. Jean Maria Arrigo, an ethicist who works closely with U.S. military and intelligence agencies, and by U.S. Army Captain Ernest Garcia, whose storied career in U.S. intelligence included both serving as a guard on the Dead Sea Scroll expeditions of Israeli archaeologist Yigal Yadin and as the Army security attaché to Project Pegasus. 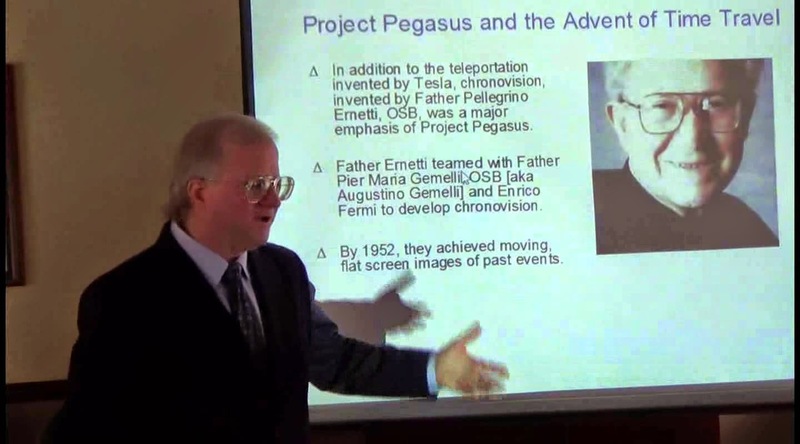 Mr Basiago has revealed that between 1969 and 1972, as a child participant in Project Pegasus, he both viewed past and future events through a device known as a “chronovisor” and teleported back and forth across the country in vortal tunnels opened in time-space via Tesla-based teleporters located at the Curtiss-Wright Aeronautical Company facility in Wood Ridge, NJ and the Sandia National Laboratory in Sandia, NM. First, the Department of Defense wanted to test the mental and physical effects of teleportation on children. Second, Project Pegasus needed to use children because the holograms created by the chronovisors would collapse when adults stood within them. Third, the children were tabula rasa (of the mind that has not yet gained impressions of experience) and would tend to see things during the time probes that adults would tend to miss. Fourth, the children were trainees who upon growing up would serve in a covert time-space program under DARPA that would operate in tandem with the overt space program under NASA. 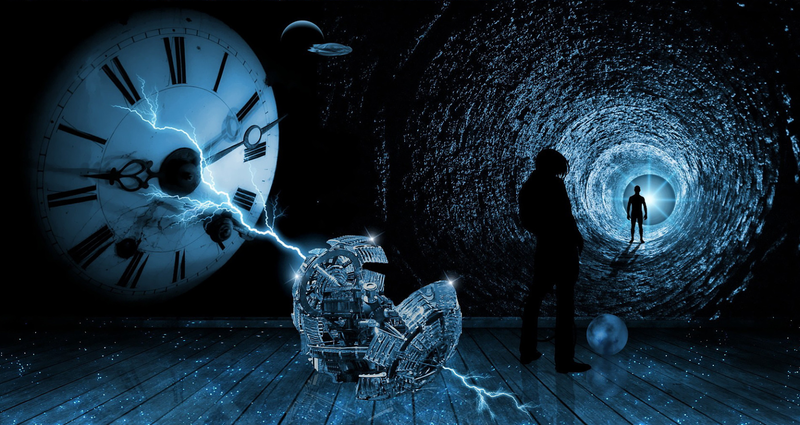 Lastly, the program sponsors found that after moving between time lines, adult time travelers were often becoming insane, and it was hoped that by working with gifted and talented children from childhood, the U.S. government might create an adult cadre of “chrononauts” capable of dealing with the psychological effects of time travel. In contrast to the chronovisor probes, in which a form of virtual time travel was achieved, the teleporters developed by Project Pegasus allowed for physical teleportation to distant locations, sometimes with an adjustment forward or backward in time of days, weeks, months, or years. According to Mr Basiago, by 1972, the U.S. government was using “quantum displacement” of this kind to both send people forward several years in time to store sensitive military secrets in the future and backward several years in time to provide the government with intelligence about future events. DARPA’s Project Pegasus (1968-73) under which the U.S. government program of quantum access Tesla-based teleportation and time travel was developed was historically under the control of then-U.S. President Richard M. Nixon’s cabinet member Donald H. Rumsfeld. According to Mr Basiago’s whistleblower testimony, Donald H. Rumsfeld, the sitting U.S. Secretary of Defense on September 11, 2001, was the defense attaché to Project Pegasus during the early 1970’s, when Mr. Rumsfeld was officially serving as a counselor to President Nixon and member of his Board of Wage and Price Stabilization. Mr. Rumsfeld approached his Project Pegasus responsibilities with the intent to weaponize teleportation and time travel to the U.S. government’s advantage. He has been quoted as stating in Project Pegasus meetings at the time that the chief mission of teleportation was to deliver troops to the appropriate place in the battlefield. It is clear from Michael Relfe’s two books on his 20 years at the secret U.S. base on Mars that U.S. time travel was principally used to the hide the presence of U.S. secret military installations on Mars from the public so that the installations remained accessible only to time scientists of the U.S. D.O.D. Mr. Relfe was recruited into the U.S. armed forces and time travel/teleported to Mars in 1976. Only individuals with access to secret time science records or technology of the U.S. Department of Defense could prove the existence of the U.S. secret Mars base from Michael Relfe’s conventional U.S. service records. On a November 11, 2009 Coast to Coast AM radio program, Mr. Basiago publicly stated that DARPA’S Project Pegasus program involving time travel was identifying future persons of interest, including those who would serve as U.S. president, and then informing such persons of their destinies. Mr. Basiago stated that in the early 1970s, in the company of his late father, Raymond F. Basiago, an engineer for The Ralph M. Parsons Company who worked on classified aerospace projects was present at a lunch in Albuquerque, New Mexico at which (then) future U.S. Presidents George H.W. Bush and George W. Bush were guests shortly after they were informed that both would one day serve as President. He also stated that in the early 1970s, the DARPA program, Project Pegasus, had identified future Presidents Jimmy Carter and Bill Clinton utilizing time travel technology. Mr. Basiago met (then) future President Barack Obama in Los Angeles, CA in 1982 while attending UCLA. Mr. Obama, then a student at Columbia University, was visiting former classmates at Occidental College in Los Angeles. A statement was made by the ally of Mr. Obama in the anti-apartheid movement which revealed that Mr. Obama, then age 20, already knew that he would one day be the President. Mr. Basiago revealed that the reason Project Pegasus was able to identify Mr. Carter, who was the then Governor of George, in 1971, as a future U.S. President, is that the program was in possession of a copy my book, Exopolitics: Politics, Government and Law in the Universe that I would not write until 1999 and would not be published as a library book until 2005, but which bears a quote on its front pages of a statement made by President Jimmy Carter. According to him, my book Exopolitics was, among other written works, physically retrieved from the future by Project Pegasus and brought back in time to 1971 or a prior time. At that time, 1971, I was General Counsel of the New York City Environmental Protection Administration and had been placed under time travel surveillance by the U.S. government. Mr. Basiago has also stated that Project Pegasus identified Laura Magdalene Eisenhower, the great granddaughter of U.S. President Dwight D. Eisenhower, as a his future ally. Thus, there is historical precedent for the covert political surveillance, via remote sensing in time, of a person of interest like Laura Magdalene Eisenhower, great-granddaughter of U.S. President Dwight D. Eisenhower. Mr. Basiago has publicly stated how in 1971 he viewed moving images of the attack on the Twin Towers on September 11, 2001 that had been obtained from the future and brought back to the early 1970’s. He has described how while serving in Project Pegasus, he viewed moving images of 9/11 at the secured U.S. defense-technical facility where they were processed after being retrieved from the future (at the Aerojet Corporation facility that once stood at the corner of Bullock Avenue and Leroy Place in Socorro, New Mexico). In all likelihood, Mr. Rumsfeld, as the defense attaché to Project Pegasus, would have known about and possibly had control over the data about 9/11 derived via “quantum access” and brought it back to the early 1970’s for analysis by the DARPA research and development program under his administrative authority. A chronovisor probe in the early 1970s by DARPA’s Project Pegasus chose an archetypal target in Washington, DC. Project Pegasus chose to view the U.S. Supreme Court building in 2013 via chronovisor and Project Pegasus participant and Mr. Basiago “found that the Supreme Court building was under 100 feet of stagnant water”. A Farsight Institute remote viewing study of natural catastrophe targeted the archetypal target right across from the U.S. Supreme Court Building — the U.S. Capitol building — in 2013. In all, 39% of the remote viewer reports viewed the U.S. Capitol in ruins alongside deep water. Results showed that 29% of Farsight remote viewers targeting the U.S. Capitol in 2013 did not see a Washington, DC devastated by natural catastrophe. Here, then, we have the 2012-13 catastrophic and 2012-13 non-catastrophic futures side by side. DARPA’s Project Pegasus chronovisor technology for probing future events in the time-space hologram was state-of-the-art in the early 1970s. Project Pegasus itself was under the policy oversight of Donald H. Rumsfeld as a Nixon cabinet member. It may have been that Presidential-level decisions were made in the early 1970s to commence underground shelter preparations, on the basis of Project Pegasus and other time-travel intelligence about the 2012-13 catastrophic timeline. It is reasonable to speculate whether the U.S. and other governments and elites may have made a fundamental miscalculation and wrong conclusion in assuming that a 2012-13 cataclysmic timeline will be the actual future, when in fact it was an alternative future that would not materialize as the actual deterministic future in 2012-13. It is also reasonable to speculate that the governments and political and financial elites have made a colossal moral error in creating safe underground bases for themselves, while making plans to leave an unwitting humanity on the surface to be ‘depopulated’ by a combination of giant solar flares, meteors from space, and a Mad Max scenario playing out — all of which is a future that does not materialize. In a July 7, 2010 presentation, Dr. Courtney Brown of the Farsight Institute stated there are anomalies that suggest the U.S. government and elites are heavily invested in covertly preparing for the 2012-13 catastrophic timeline, while keeping the bulk of the human population in the dark. These anomalies, such as rapid expansion of deep underground military bases to accommodate all U.S. government, military and police forces, and political and financial elites, suggest that they have accepted that the 2012-13 catastrophic future is the most probable future, and are feverishly completing underground facilities on Earth (as well as secret bases on Mars). Basiago’s Pegasus revelations establish that a secret, advanced U.S. time-space program emerged 40 years ago. For four decades, this program has used esoteric technologies involving chronovision and teleportation to perform “remote sensing in time” of past and future events. For the past three decades, teleportation has also been used to send individuals from Earth to strategic U.S. bases on Mars. He is adamant that these technologies be revealed so that their positive and negative aspects can be debated and their positive aspects used to the advantage of humanity. Chronovision, he said, could be used to create an international network of virtual museums in which images from the past would be shown to enlighten and educate the public. Misapplied, such technology could also be used to create a Fascist society based on 24-hour surveillance of individuals by government, which may have been portended by the DARPA project called “Total Information Awareness” that President George W. Bush established and placed under Admiral John Poindexter. Teleportation is a second quantum access technology developed with public funds that the public is being denied the full benefits of. Teleportation could be used, Basiago said, to move people and goods more quickly and efficiently around the globe, without the pollution caused by planes, trains, and automobiles or the negative land use effects from airports, railroad tracks, and highways. Yet, if it is not declassified, teleportation will remain what it has been for 40 years, that is, a weapon for use only by the U.S. military, to have the option to put troops precisely where they are needed on battlefields. “I take my responsibilities as a planetary whistleblower very seriously,” Basiago said. “This is a truth campaign for positive human development on this planet. The people of this planet have a right to a true telling of the natural history of the solar system that we inhabit. This includes the truth that Mars is an inhabited planet and also that the United States’ secret space program has already sent individuals from this planet to the Red Planet. “If we are to achieve a sustainable human future on this planet, we must demand that the US government reveal the teleportation that has been used to reach Mars so that it can now be used to revolutionize human transport on Earth. NOTE: This article is part of a continuing series on quantum access and other exotic technologies that have been developed by black budget military and intelligence projects and applied to date principally for weapons uses, rather than for the benefit of humanity, who in the end have paid with public funds for their original development. This article originally appeared in Veritas Magazine, Australia.